Perfumes are made of a combination of chemicals. These chemicals are designed to have a pleasant and attractive odor. Unfortunately, some individuals apply too much perfume, which causes it to lose its appeal. 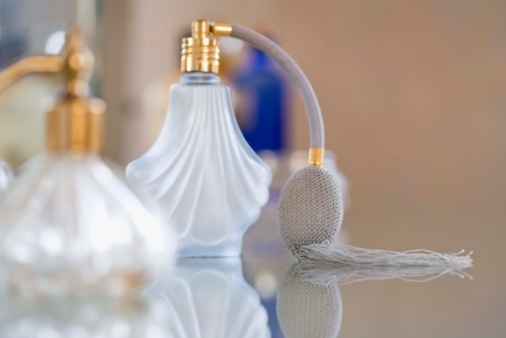 The perfume can end up sticking to the fibers in your furniture. If you have a guest who leaves a lingering perfume odor on your furniture after she is gone, you will need to take immediate action to remove the strong smell. Too much perfume can be a bad thing. Open the windows in the room. Turn on any fans you have in the room to get fresh air flowing through the fibers of your furniture. The fresh air will help flush out the perfume odor. Pour white distilled vinegar into a spray bottle, and mist your furniture with it. The vinegar works to eliminate strong odors, such as perfume. The vinegar won't stain the furniture. Leave windows open and the fans going, as vinegar has a strong odor of its own. Don't worry though; this odor will dissipate and take the perfume odor with it. Open a box or two of baking soda, and set it next to furniture that smells of perfume. Baking soda will absorb the perfume odor that rises from the furniture. Repeat these steps after 24 hours if the perfume smell remains.